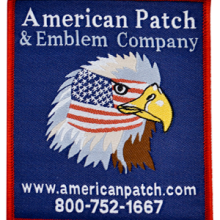 Both embroidered patches and woven patches are created by stitching threads onto a backing material to create a design. When it comes to dye sublimated patches, however, small sections of the patch material is dyed with a special ink to create a design. Patches have always been stitched using thread, and with both embroidered and woven patches, thread is used to create the image, symbol, or lettering. The difference between the two styles is the thickness of the thread. Embroidered patches use a thicker thread to create a traditional “raised” look while woven patches (like the one above) use a thinner thread to make a flatter patch. Any type of patch can be colorful, but some have the capability more than others. Threads come in a wide variety of colors, but since woven patches use thinner thread than embroidered, you may be able to incorporate more colors on woven patches. Dye sublimated patches, however, give you the widest range of colors, since each molecule of the patch is dyed, virtually any color can be created. If you’re looking for a patch with a lot of detail, choose a dye sublimated patch. Because each molecule is dyed, a great amount of detail can be achieved in a design. 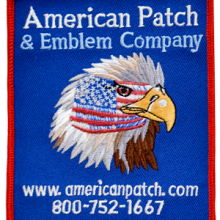 For patches with some detail, choose woven, and for basic patches, choose embroidered. 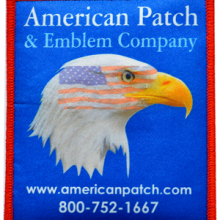 No matter which patch type you’re interested in, American Patch can help you create your perfect patch for any occasion. This entry was posted in General Information and tagged details, dyed, embroidered, embroidery, thread, twill, woven.